This struck a chord with me. I’ve lived and worked in 6 countries, whilst travelling to visit over 150 cities in the world. Yet, I don’t remember all of it; the travelling that had the most profound effect on me were also the ones filled with fear. It might not have been a jungle exploration or coming close to being eaten by a lion on the African safari, but more so, the sense of insecurity I had felt when meshed in unfamiliar geographies. The instinctual response to fear is to get rid of it. The web is loaded with articles on how to get rid of fear. I agree that unnecessary fear inhibits the mind, but I advocate that we embrace the fear within us and transform it into fuel. Every time I had travelled or moved to a different country since I can remember, I was wrought with fear. Fear for the uncertainty, the language barrier, security, or simply, where can I buy breakfast. Every bit of travelling expended mental energy. Sometimes, I was so exhausted from trying to explain myself in frantic gestures in order to get a bottle of water from the corner shop because I couldn’t utter the local language, that I’d prefer to go thirsty. Other times, I was just afraid people would laugh at my strange accent. The fear made me feel uncomfortable, and embarrassed. Indeed, the reaction was to go home to what I was familiar with, or to go travelling only to a place I had been before and knew my way around. However, the fear also made me more alert to my surroundings. 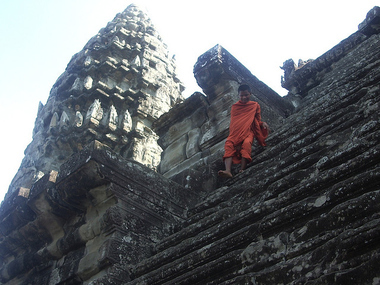 A few years back, as I sat at Angkor Wat, breathing in the majesty of the ancient architecture and the spirituality of the construction, I also noticed little children dressed in rags, running around selling cold water for USD1. Their joyful little faces for having sold a bottle touched my heart. I could not understand why they were so happy, and that I was filled with void and emptiness for making many more times that money at my job. They had no food, and I had gourmet cuisine at my fingertips. The Cambodians only recently experienced some of the most traumatizing genocide and human tragedies in their history. I had never seen a war. I was overwhelmed with compassion for the less fortunate around me. Surely, poverty existed also in my hometown, and yet I had never noticed it before. I had also, not had the time to slow down and think about the life I was living, fooling myself that I was enjoying it, and allowing my pride to over bolster my ego. Travelling brought me out of my comfort zone. I questioned myself: my life, my plans, and the community around me. I asked what I could do better for me and for others. I searched within my soul for the darkness and ugly side of me that I needed to confront. I was shaken with fear not only for burglars and unclean food in a city I had not been in, but for fear of what my life’s purpose was in the bigger picture and what I might discover of myself. I fear for what I might unveil about myself on the journey, because old habits were easier to indulge in. Since that fateful day in Siem Reap, I had been planning my exit from a corporate job, and also started taking part in more charity work for children wherever I might be based. Life took a different course than I had planned with my illness 2 years ago but that’s a different story for another day. Fear became a friend, and taught me to become sensitive to my inner voices, and empathetic to others. Fear brought about my self-awareness. Every time I travel, there is a nervous anticipation to what I might discover on the trip. Sunbathing on a beach or visiting the local museum alike, I let my senses open up to what the universe is trying to tell me. And so I urge you, the next time you travel to a foreign city, and you are scared of talking to a stranger, or how to get cash, allow the fear to consume you. Embrace the fear and let it open your eyes to things you did not think you would see. Travel with sensitivity. Fear can be your friend. Be not afraid of it. « What Are the Benefits of Taking a Vacation?